The Dell Alienware Area-51 A51R2-1172SLV Gaming Desktop features a triangular case that allows easy access to all the ports and provides efficient cooling for the internal components by offering a large space for hot air to escape. This desktop computer is outfitted with the 5th generation Broadwell 3.3 GHz Intel Core i7-i7-5820K processor that comes with 15MB of L3 cache memory and six cores, which allows for greater multi-tasking capabilities. It comes equipped with 8GB of DDR4 memory to help you run multiple applications and can also support up to 32GB when applications require more. Windows 8.1 is pre-installed on the 2TB 7200 rpm hard drive that still offers enough space to store all your important files, photos, videos, and more. Experience lag-free gameplay and smooth 1080p video playback with the NVIDIA Geforce GTX 980 graphics card with 4GB of video memory. This graphics card supports multiple monitors and offers HDMI, DisplayPort, and DVI ports for immersing you when gaming or working. For connectivity, this desktop provides Gigabit Ethernet, 802.11ac, Bluetooth 4.0, four USB 2.0, and six USB 3.0 ports as well as a plethora of audio ports that are powered by Creative Sound Core 3D audio technology. Furthermore, you can save and transfer data using the memory card reader or the slot-loading DVD burner. The Area-51's three corners are built to support 5 times the system's weight. Pivot the system towards you and gain easy access to the rear ports when connecting or disconnecting cables. There is even a button on the back of the chassis that turns on the rear accessibility lighting to help you see. The rugged handles make the Area-51 more natural to carry. The shape and internal component layout are designed to have a low center of gravity to avoid the system from tipping when being lifted. Internal fans blow fresh ambient air, quietly, and directly onto the graphics card. The internal cable management system enables maximum airflow - satisfying your system's hunger for cooler air and keeping it performing at its peak. The angled design also provides a large space for hot air to escape where a traditional rectangular chassis only leaves a small space between it and the wall. 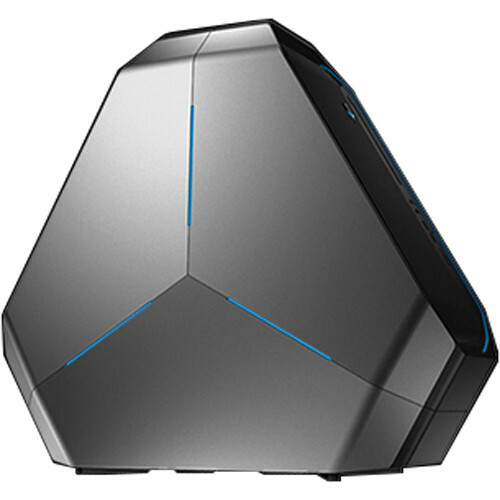 The Alienware Area-51 ushers in performance with Windows 8.1 and a 6-core Intel Core i7 processor. The Intel X99 Express chipset supports 2133 MHz DDR4 memory - up to 32GB in quad channel. In addition, the processor is liquid cooled, allowing it to be easily overclocked. The storage bays support up to five drives of either SSD or HDD. Enjoy the pure speed of solid state and the big storage of hard drives - allowing for quick boot and massive archiving capabilities. The Ethernet assembly has been built by Killer Technology. It prioritizes streaming video and gaming packets for the smoothest possible performance when you need it most. Plus, it comes fully equipped with 802.11ac - the latest wireless protocol. Customize your lighting experience with AlienFX that provides nine independent programmable lighting zones. You can create up to 512 trillion color combos with over 20 colors to choose from. The Alien Adrenaline performance monitoring app lets you view detailed graphs that tell you real-time details about the CPU, memory, graphics card, and network adapter. Manually tinker with the settings of your CPU to raise performance even beyond the stock settings. Optimize the memory for maximum performance and ensure that your system runs at peak power while gaming. Enhance your gaming features and squeeze as much power as possible by adjusting the system's settings. Alienware's Thermal Controls allow you to control the thermal and venting behavior of your Area-51. You can also create and save multiple thermal and venting profiles for different usage scenarios. Box Dimensions (LxWxH) 31.0 x 30.0 x 15.5"
Is this KC (Korea Radio Certification) certified? Please check on the unit and let me know. Computers do not use radio certification.